The electroDOT harmonises radiation from mobile phones and computers. Are you one of those people who’s concerned about using their mobile phone? Perhaps you know someone who refuses to put their mobile phone to their ear to talk but rather only uses the loudspeaker? Do you find yourself getting tired from working on your computer for too long? 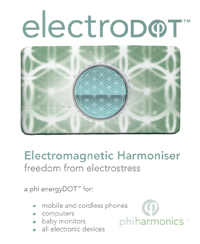 The electroDOT is the core of the Phi energyDOT range of vibrational healing devices. It’s programmed to retune electromagnetic radiation from the electronic equipment you use regularly, something for which each cell in our body acts like an antenna, i.e. an extremely sensitive receiver and transmitter. As a result, the body ‘picks up’ and reacts to any such field to which it is exposed. The effects from this vary but, ultimately, our bodies have not had time to adapt to this artificial electromagnetic environment in which we now live. Tiredness, headaches, concentration issues, irritability, dizziness, stress and depression can have many causes, but if you suffer from any of these and have eliminated all obvious causes, it’s possible that they relate to EMF radiation exposure. Precautions must be taken to reduce these negative effects – it’s nothing new that EMF radiation is linked with health problems and it’s only going to get more pronounced as technology advances. How to use the electroDOT? Insert the DOT into the battery compartment of a mobile or cordless phone if it fits. Alternatively, peel off the protective backing and attach the DOT to your device. In fact, you can stick an electroDOT to any electronic device that you feel uncomfortable being around or that which contributes to your symptoms. Each electroDOT has a radius of 5 metres, so it can be stuck wherever you prefer, as opposed to any specific position. The image below shows a “before and after” thermal imaging scan from using the electroDOT in the way described. 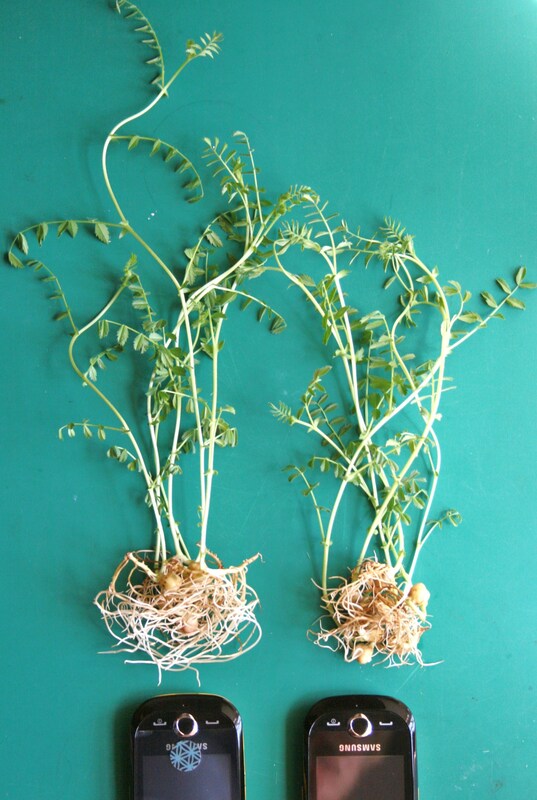 Below, the image demonstrates electroDOT Harmoniser’s effect observed in chick pea growth under exposure to mobile phone emissions. Pulses on the left were grown next to a harmonised mobile phone (with electroDOT). The pulses on the right were grown, for the same 15 day period, next to an unharmonised mobile phone (without electroDOT). Have a look at the electroDOT here in our online shop. Watch this video on the electroDOT from Phi. And, for those of you who are really interested in the science, take a look below at some tests that show changes in our blood when using mobile phones. 3. Live Bloods: After an hour’s exposure to EMFs and one hour using electroDOT. In image 2 above, you can see an extreme, accelerated pleomorphic/blood transformation has taken place – the bilipid membrane of the red blood cells (RBCs) has become challenged by increased acids. The RBCs have lost their negative charge and instead become positively charged, clinging together and exuding an unhealthy cellular glue. In this state, RBCs are no longer able to efficiently transport oxygen and micronutrients around the body. Resulting symptoms include: fatigue, foggy thinking, breathlessness, poor memory, bad circulation, easy bruising, heart palpitations and palpitations. You are currently reading energyDOTs: electroDOT at Universal Essences.